Lodwar town, Turkana County’s capital, is located in arid North-Western Kenya on the banks of the Turkwel river. In recent years, with the devolution in Kenya and the discovery of oil resources in the region, Lodwar has seen a rapid expansion. However, due to limited investment in water resources development, supply is lagging behind demand, and a large proportion of the town’s poor remain water insecure. Despite the reported existence of a large groundwater reservoir (the Napuu aquifer) nearby the town, domestic water demand is only partially satisfied due to a lack of physical infrastructure for drilling, extracting, transporting and distributing water to the town. 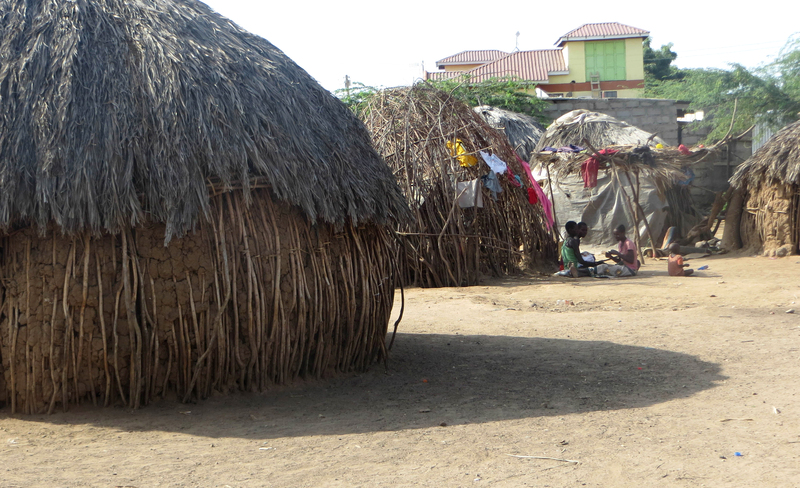 Households largely depend on shallow boreholes located in the sand beds near the Turkwel river for water supply. In addition to being one of the poorest counties in Kenya, Turkana County is also one of the driest: its climate is arid, rainfall is highly variable, and water resources development has not kept pace with demand growth. At the edges of Lodwar Town, the Kawalasee river, a tributary of the Turkwel, is running nearly dry following months of severe drought in Turkana (taken March 2017, credit: Dr Feyera Hirpa). The majority of Turkana’s one million people are nomadic pastoralists who depend on the river water for population and livestock needs. They are thus highly vulnerable to water scarcity caused by drought or over-abstraction upstream. Severe drought has become a common occurrence in Turkana, and other arid and semi-arid counties in Kenya. The recent 2015-16 drought affected 3.4 million people, or a quarter of the population, in 23 arid and semiarid counties. It disrupted water and food supplies, and resulted in Kenya’s president declaring drought a national disaster in February 2017. One-third of Turkana’s population required food, water and financial assistance in early 2017. 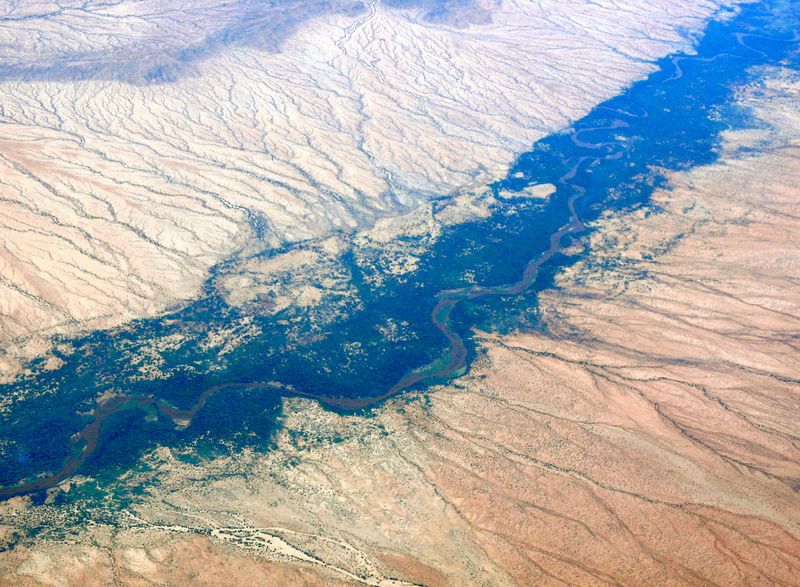 The Turkwel river is the largest and the only perennial river in Turkana County. It originates in the Western Kenyan highlands and drains to Lake Turkana, the largest desert lake in the world. 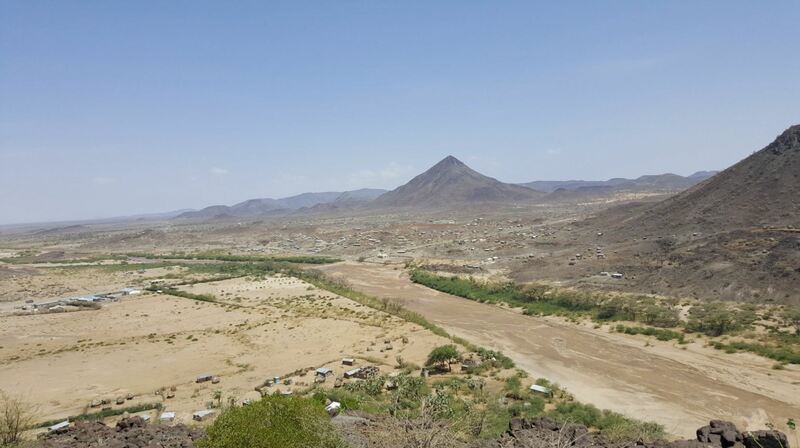 Because Lodwar town is located at the lower end of the basin, over-abstraction upstream could considerably reduce the volume of water that reaches the town. The Turkwel river basin experiences a compound effect of both physical and economic water scarcity. On one hand, low and highly variable rainfall in the basin means that the available water is not adequate to satisfy the growing demands, even during non-drought years. On the other hand, the lack of investment in water resources development and the limited capacity of institutions to enforce water regulations (such as environmental flow requirements) make water access more challenging, especially for poor and marginalised communities. The river basin supports several socio-economic activities. Numerous small-scale irrigations depend on the river for water. The Turkwel Gorge Dam, a hydroelectric dam with the largest storage capacity in Kenya, impounds 41% of the total rainfall volume of the river basin. The dam, located in upstream West Pokot County, generates 106MW energy, 10% of the national hydroelectric grid. In addition, the emerging oil industry in the region is in search of adequate water supply for oil production. Overall, water plays a critical role in the county’s development, and its demand is growing, and fast. 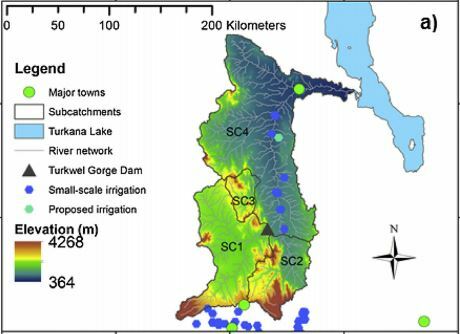 Our recent open access paper aims to identify the main drivers of water scarcity in the basin. We used a water allocation model driven by a range of climate scenarios and several water demand options to identify the conditions that can lead to the risk of unsatisfied water demands and unsustainable groundwater abstraction rates. The results of our analysis show three key points. First, examining historical rainfall data, shows that rainfall has been highly variable in the basin. The annual rainfall varied from 40% less to 40% more than the long-term mean (1984-2013), with several years receiving abnormally low rainfall. The frequent occurrence of severe droughts substantially reduces water availability in the basin by decreasing river flow and groundwater recharge. This can lead to severe risks of not meeting water demand and depleting groundwater. Secondly, climate projections point to a warmer and wetter future climate in the basin. However, the uncertainty with climate models is high, and studies in East Africa suggest that these models struggle to accurately predict long-term rainfall trends. There is thus a danger in using these projections for water resources planning in the basin, as these may lead to a mal-adaptation. Finally, a potential increase in irrigated agriculture, the largest water consumer in the basin, without new investment in water resources development, will exacerbate water scarcity. Our analysis shows that a potential increase in crop irrigation from 18 km2 to 250 km2 in the basin will increase the unmet water demand from 0.1% to 8.9% of the total demand and the loss in groundwater storage from 27% to 61% over the study period under present climate. This will also increase the water scarcity risk posed by the future climate. Finding sustainable water futures in the Turkwel river basin involves managing trade-offs and setting priorities among multiple development projects, and developing additional water supply sources. The trade-offs include making informed decisions about the newly proposed irrigation of sugar cane and food crops, adapting the dam operation to downstream needs, and enforcing the environmental flow requirements. Moreover, investing in the development of groundwater resources, strengthening water institutions and enhancing understanding of the climate risks are all key to reducing water scarcity risks in the river basin.